Giveaway ends April 29, 2017. NOT Just another WordPress site. HaHa! There’s a Pooker on My Pillow! 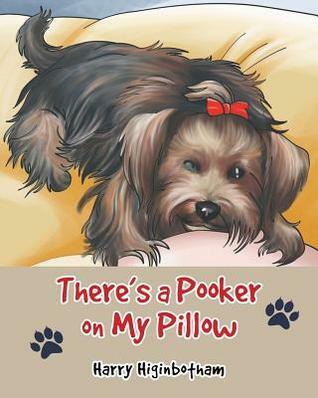 So, There’s a Pooker on My Pillow (Pooker Book Web Page) has been published. Keep in mind that this could change, but that’s my thinking right now. Bear in mind that each book will have a core theme, just like Pooker. I won’t reveal those just yet, however. I want you to come back & check out my progress, so I’ll add little tidbits of information as I go. I look forward to this journey! I wrote another book too! So about 12 years ago I self-published a book co-written with my brother Dan. It was based upon the social convention of automatically saying “fine” when someone asks, “how are you?”. My mother, my brother and I actually brainstormed “snappy answers to ‘how are you? '” and I compiled them, added clip-art to go along with most of them, and found a self-publishing web site, lulu.com which I used to self-publish the book. I’ve never really done any marketing for it so it’s only sold a few copies, mostly iBooks and mostly in Great Britain. My genealogy is mostly British as well, so I guess that should come as no surprise. I tend to have a dry, British-y sense of humor. Anyway, the book is called 108 1/2 Snappy Answers to “How Are You?” or 109 1/2 Ways to Lose Friends. It is available for purchase here: Go Here & Buy My Book! Thanks!! A: Apathetic, but it doesn’t matter. A: Double-parked in the red zone of life. Yeah, they’re all pretty much like that. So if you have the inclination (first of all don’t fall down) check it out! Yo- WriterDude- What’s a Bloorg, Anyway?